The SuperFreeze Pipe Freezer is an easy-to-use pipe-freezing unit that allows the contractor to keep water systems operating while making repairs. 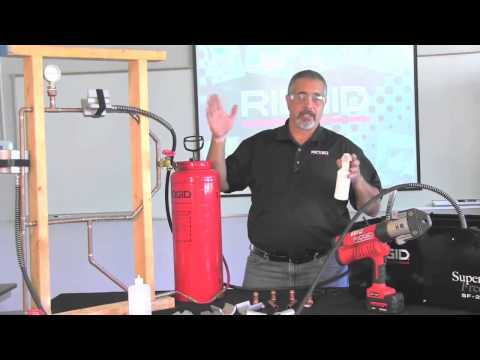 The RIDGID® Model SF-2500 is a mini-refrigeration unit that circulates self-contained refrigerant to its aluminum freeze heads. This forms an ice plug in as little as 6 minutes. Once the pipe is plugged, repairs can be made while the ice plug is maintained by the unit. Includes a bottle of specially formulated freeze gel to speed freezing. Apply the gel to freeze heads before placing on pipe. SF- 2500, 115V Copper tube: 1⁄2 - 2 1⁄2 inch (15 - 65 mm). Steel pipe: 1⁄2 - 1 inch (15 - 25 mm). The freeze head cavities on these units are specifically sized for copper tube sizes. They may be used on steel pipe sizes with adherence to the instructions. Compressor Rotary, 230V, 50 Hz, 2.4 amp, 505 Watts. Hose Length 2,6 m ( 5.2 m span). Dimensions 22 7⁄8" (58 cm) x 11" (28 cm) x 14 1⁄2" (37 cm) (L x W x H). Model SF-2500 SuperFreeze is rated 5.0 out of 5 by 3. Rated 5 out of 5 by garygreg from great machine, easy to use saved the price of the machine in its first use. no weekend full building shut down with full crew. that would be 36hrs. did it by myself in 6hrs. much easier to use than the nitrogen version. also the 2.5" size will chill a beer in 3mn. don't know durability yet but im sure this machine will last forever just like all other ridged tools. Rated 5 out of 5 by willy from model sf-2500 SuperFreeze The superfreeze was purchased because we have an aging plumbing system ,that the valves need replaced. I have used the machine to freeze lines up to 2 inch with no problem.It is a machine that every commercial and indusrial facility maintenance dept. should have in there dept. Do you make shoes to freeze 3&quot; steel pipe that fit the super freeze 2500 machine? No, my apologies, but the max capacity of this machine is 2 inches.